Dubai: Oil prices are likely to look beyond the supply and demand dynamics that govern them — to factor in events such as the trade talks between the US and China and the behaviour of stock markets and bonds — and rise over the next few weeks, experts say. Brent crude and West Texas Intermediate has been on a recovery path since the start of the year. 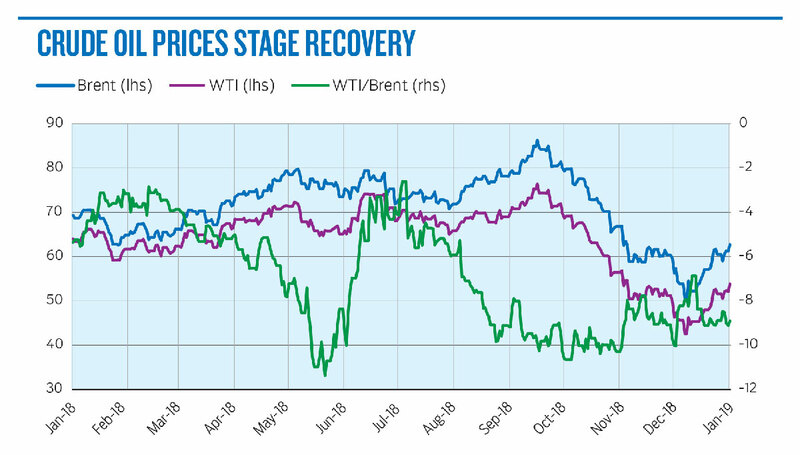 Brent crude has gained 16 per cent since the end of 2018, while the WTI has accumulated 18 per cent in gains since January 1. On Friday, the WTI rose 3.25 per cent at $53.76 (Dh197) a barrel, Brent crude was up 2.29 per cent at $62.58 per barrel. “With the Opec+ group of nations doing their best to curb supply, the demand side remains the key area of uncertainty. Consequently, the main focus and price driver at this stage remains macroeconomic developments as seen through the performances of stocks and corporate bond yields,” said Ole Hansen, head of commodity strategy at Saxo Bank. WTI and Brent crude have both settled into their November to December consolidation ranges, which for WTI is between $50 and $55 and $57.50 to $64 for Brent, Hansen said. The Opec plus group, which includes major oil producers such as Saudi Arabia and Russia, has agreed to cut 1.2 million barrels of oil per day of supply from the oil market to cut the surplus, and boost prices. The oil producers will be reviewing the agreement in six months. On the demand front, the International Energy Agency revised its demand projection upwards to 1.4 million barrels per day from the earlier expectation of 1.3 million barrels per day. “We are still sceptical that 2019 will be a faster year of growth than 2018 given non-trade related risks (eg volatile FX, debt levels, withdrawal of monetary stimulus) to the performance of most economies, not least of which are China and India. Trade talks between China and the US are yet to be resolved and there is no guarantee that they will end positively, keeping a prominent downside risk entrenched in oil markets for the year,” said Edward Bell, Commodities Analyst at Emirates NBD. The price market structure for the Brent crude price has flipped to a slight backwardation after hovering in a slight contango for the past two weeks. The 1-2 month spread ended the week at $0.11 per barrel in backwardation while the June/Dec 19 spread ended the week backwardated by $0.41 per barrel, its widest level since mid-November, according to Bell. “Recently implemented Opec+ cuts and increased pressure on Iran should tighten up supply and push the market into deficit come in the second half. We expect these factors will prove supportive for oil prices this year and believe the term structure of Brent will rotate from contango into backwardation in 2Q19 as the market tightens. WTI crude structure is likely to remain under pressure during first half as infrastructure constraints and refinery turnarounds result in further builds at the Cushing hub,” Francisco Blanch, Commodity and Derivatives Strategist at Bank of America Merrill Lynch said.